Highsec is such an orderly place these days--and it's all thanks to the Code. Consider this gank. Was the destruction of this Retriever a senseless act of violence? Random griefing? Bullying? Or--heaven forbid--torture? On the contrary. Each and every gank is thoroughly vetted. An extensive process takes place before and after the gank to ensure that no reasonable complaint can be made. And it's always done perfectly. Consider the case of Nakari Gufrai. He had a mining permit. 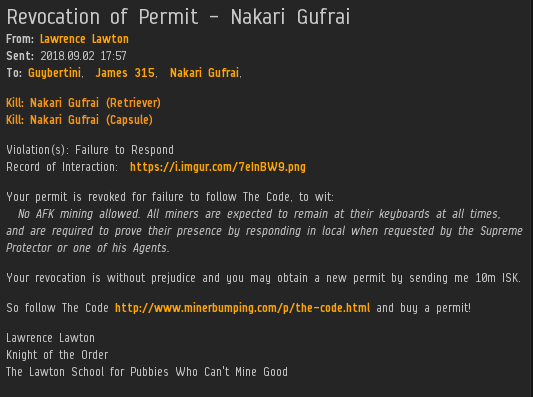 The rebels and Anti-Gankers and bot-aspirant apologists out there will tell you that a New Order mining permit is worthless. They'll insist that you're just as likely to be ganked following the Code as not following it. "Being at your keyboard doesn't make a difference." But look at what actually happened here. Agent Lawrence Lawton's conduct couldn't be questioned by any reasonable, rational person. Adding an extra layer of protection, Agent Guybertini (who issued the original permit to Nakari) was immediately contacted so that he could review the matter himself. Nakari was given a post-gank interview to see if there was anything Agent Lawrence missed. 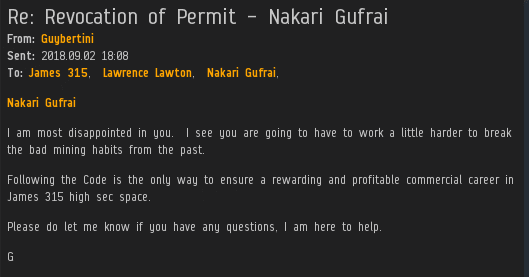 Despite being a ganked permit-holder, Nakari couldn't complain. He didn't have any grounds for complaint, and he knew it. Nevertheless, some of the miner's worst instincts came to the surface. As an emergency measure, our Agent deployed the name of the Saviour of Highsec. For the worst miners, hearing my name will make them squeal with rage. For the better miners, it makes them open their wallets. Everything worked out just fine. So much for all those horror stories you hear from the theme park advocates about bullying and harassment. Guybertini had just learned of Nakari's permit revocation when he received news that the miner had paid up again. The New Order is extraordinarily efficient. Nakari proudly presented his shiny new permit. He didn't have a problem with the way he was treated. Why should anyone else? When it comes to criminal justice, the Code and its enforcers are the gold standard. Everyone has a lot to learn from us. 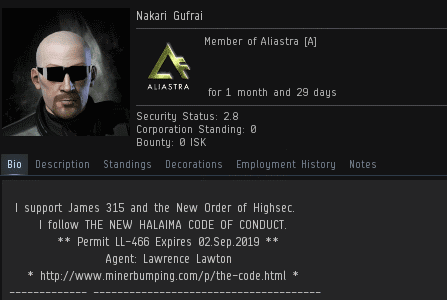 The fact that Code Agents such as Lawrence conduct such detailed investigations, whilst only using violence as a last resort, is the reason why no permit holder has ever been ganked in error by CODE. 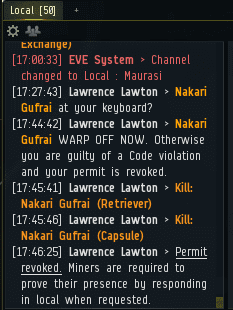 I did not see guybertini's talos on the killmail lawrence. Guybertini was CC'ed because he was the issuing Agent of the revoked permit. Calm down murder lover. Ritalin is easy! Calm down johnniepedo, your Mom is easy. The shear volume of constant failure from anti-ganking is astounding. 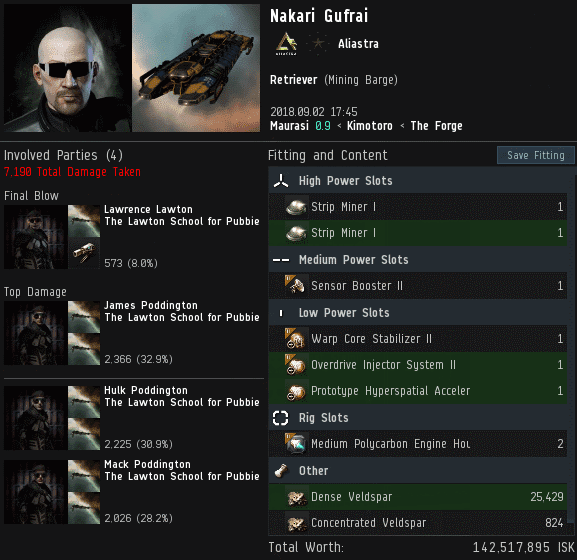 I am considering reporting them to CCP. It is obvious they are using some kind of exploit to fail so hard. Hahahahahaha. You are so mad at losing a mining barge you come to the comments section and squawk the same sentence like a parrot and think correcting grammar makes you somewhat relevant. That is some A grade butthurt. Don't make him get his leesh!